Here is the problem with a closed mind and guilt by association. 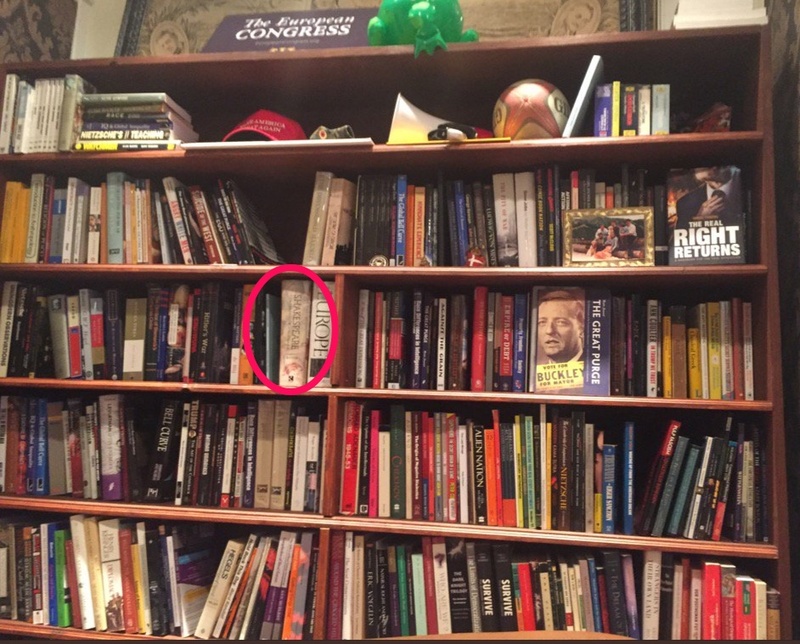 But smack in the middle of the bookshelf appears to be the complete works of Shakespeare. Also visible on the shelves is a book about the teachings of Nietzsche and Charles Murray's book. The Bell Curve. I have problems with some of the views of Nietzsche and Murray but their arguments certainly make sense to understand if for no other reason than to recognize where they went off the rails. The great economist Ludwig von Mises used to say that you not only want to read arguments you agree with but the arguments of those you disagree with---that's what moves you in the direction of being a scholar. Closed minds make for shallow perspectives. The time is coming when anyone who does not enthusiastically support the progressive agenda will be branded a racist and part of the Alt Right. Mainstream conservatives are learning that now. One of the great joys of reading the Summa Theologica by Thomas Aquinas has to do with the fact that he presented all the arguments AGAINST his proposal with as much vigor, knowledge, and intelligence as he did the arguments for.